"Pure silk" redirects here. For women's professional golf tournament, see Pure Silk-Bahamas LPGA Classic. The word silk comes from Old English: sioloc, from Ancient Greek: σηρικός, translit. sērikós, "silken", ultimately from an Asian source — compare Mandarin sī "silk", Manchurian sirghe, Mongolian sirkek. India is the second largest producer of silk in the world after China. About 97% of the raw mulberry silk comes from six Indian states, namely, Andhra Pradesh, Karnataka, Jammu and Kashmir, Tamil Nadu, Bihar and West Bengal. North Bangalore, the upcoming site of a $20 million "Silk City" Ramanagara and Mysore, contribute to a majority of silk production in Karnataka. The Rajshahi Division of northern Bangladesh is the hub of the country's silk industry. There are three types of silk produced in the region: mulberry, endi and tassar. Bengali silk was a major item of international trade for centuries. It was known as Ganges silk in medieval Europe. Bengal was the leading exporter of silk between the 16th and 19th centuries. In the Odyssey, 19.233, when Odysseus, while pretending to be someone else, is questioned by Penelope about her husband's clothing, he says that he wore a shirt "gleaming like the skin of a dried onion" (varies with translations, literal translation here) which could refer to the lustrous quality of silk fabric. Aristotle wrote of Coa vestis, a wild silk textile from Kos. Sea silk from certain large sea shells was also valued. The Roman Empire knew of and traded in silk, and Chinese silk was the most highly priced luxury good imported by them. During the reign of emperor Tiberius, sumptuary laws were passed that forbade men from wearing silk garments, but these proved ineffectual. The Historia Augusta mentions that the third-century emperor Elagabalus was the first Roman to wear garments of pure silk, whereas it had been customary to wear fabrics of silk/cotton or silk/linen blends. Despite the popularity of silk, the secret of silk-making only reached Europe around AD 550, via the Byzantine Empire. Legend has it that monks working for the emperor Justinian I smuggled silkworm eggs to Constantinople in hollow canes from China. All top-quality looms and weavers were located inside the Great Palace complex in Constantinople, and the cloth produced was used in imperial robes or in diplomacy, as gifts to foreign dignitaries. The remainder was sold at very high prices. In the Torah, a scarlet cloth item called in Hebrew "sheni tola'at" שני תולעת – literally "crimson of the worm" – is described as being used in purification ceremonies, such as those following a leprosy outbreak (Leviticus 14), alongside cedar wood and hyssop (za'atar). Eminent scholar and leading medieval translator of Jewish sources and books of the Bible into Arabic, Rabbi Saadia Gaon, translates this phrase explicitly as "crimson silk" – חריר קרמז حرير قرمز. A hundred-year-old pattern of silk called "Almgrensrosen"
Wild silk taken from the nests of native caterpillars was used by the Aztecs to make containers and as paper. Silkworms were introduced to Oaxaca from Spain in the 1530s and the region profited from silk production until the early 17th century, when the king of Spain banned export to protect Spain's silk industry. Silk production for local consumption has continued until the present day, sometimes spinning wild silk. The history of industrial silk in the United States is largely tied to several smaller urban centers in the Northeast region. Beginning in the 1830s, Manchester, Connecticut emerged as the early center of the silk industry in America, when the Cheney Brothers became the first in the United States to properly raise silkworms on an industrial scale; today the Cheney Brothers Historic District showcases their former mills. With the mulberry tree craze of that decade, other smaller producers began raising silkworms. This economy particularly gained traction in the vicinity of Northampton, Massachusetts and its neighboring Williamsburg, where a number of small firms and cooperatives emerged. Among the most prominent of these was the cooperative utopian Northampton Association for Education and Industry, of which Sojourner Truth was a member. Following the destructive Mill River Flood of 1874, one manufacturer, William Skinner, relocated his mill from Williamsburg to the then-new city of Holyoke. Over the next 50 years he and his sons would maintain relations between the American silk industry and its counterparts in Japan, and expanded their business to the point that by 1911, the Skinner Mill complex contained the largest silk mill under one roof in the world, and the brand Skinner Fabrics had become the largest manufacturer of silk satins internationally. Other efforts later in the 19th century would also bring the new silk industry to Paterson, New Jersey, with several firms hiring European-born textile workers and granting it the nickname "Silk City" as another major center of production in the United States. In Terengganu, which is now part of Malaysia, a second generation of silkworm was being imported as early as 1764 for the country's silk textile industry, especially songket. However, since the 1980s, Malaysia is no longer engaged in sericulture but does plant mulberry trees. The high proportion (50%) of glycine allows tight packing. This is because glycine's R group is only a hydrogen and so is not as sterically constrained. The addition of alanine and serine makes the fibres strong and resistant to breaking. This tensile strength is due to the many interceded hydrogen bonds, and when stretched the force is applied to these numerous bonds and they do not break. Biodegradability (also known as biodegradation)--the ability to be disintegrated by biological approaches, including bacteria, fungi, and cells—is another significant property of biomaterials today. Biodegradable materials can minimize the pain of patients from surgeries, especially in tissue engineering, there is no need of surgery in order to remove the scaffold implanted. Wang et al. showed the in vivo degradation of silk via aqueous 3-D scaffolds implanted into Lewis rats. Enzymes are the means used to achieve degradation of silk in vitro. Protease XIV from Streptomyces griseus and α-chymotrypsin from bovine pancreases are the two popular enzymes for silk degradation. In addition, gamma-radiation, as well as cell metabolism, can also regulate the degradation of silk. ^ "Silk". The Free Dictionary By Farlex. Retrieved 23 May 2012. ^ a b Sutherland TD, Young JH, Weisman S, Hayashi CY, Merritt DJ (2010). 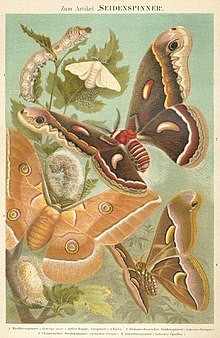 "Insect silk: one name, many materials". Annual Review of Entomology. 55: 171–88. doi:10.1146/annurev-ento-112408-085401. PMID 19728833. ^ Walker AA, Weisman S, Church JS, Merritt DJ, Mudie ST, Sutherland TD (2012). "Silk from Crickets: A New Twist on Spinning". PLoS ONE. 7 (2): e30408. Bibcode:2012PLoSO...730408W. doi:10.1371/journal.pone.0030408. PMC 3280245. PMID 22355311. ^ "Silk". Etymonline. Archived from the original on 14 December 2013. Retrieved 27 August 2012. ^ Sindya N. Bhanoo (20 May 2011). "Silk Production Takes a Walk on the Wild Side". New York Times. Archived from the original on 9 November 2012. Retrieved 26 May 2011. ^ Hill (2009). "Appendix C: Wild Silks," pp.477–480. ^ Gheysens, T; Collins, A; Raina, S; Vollrath, F; Knight, D (2011). 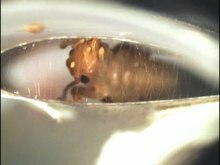 "Demineralization enables reeling of Wild Silkmoth cocoons" (PDF). Biomacromolecules. 12 (6): 2257–66. doi:10.1021/bm2003362. PMID 21491856. Archived (PDF) from the original on 22 September 2017. ^ "Silk: History". Columbia Encyclopedia Sixth Edition. Archived from the original on 16 December 2008. ^ "Oldest Evidence of Silk Found in 8,500-Year-Old Tombs". Live Science. Archived from the original on 13 October 2017. Retrieved 13 October 2017. 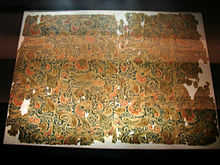 ^ "Prehistoric silk found in Henan". The Institute of Archaeology, Chinese Academy of Social Sciences (IA CASS). Archived from the original on 4 January 2017. Retrieved 4 October 2017. ^ "Textile Exhibition: Introduction". Asian art. Archived from the original on 8 September 2007. ^ a b "Chinese archaeologists make ground-breaking textile discovery in 2,500-year-old tomb". People's Daily Online. Archived from the original on 13 October 2007. Retrieved 26 August 2007. ^ Hill (2009). Appendix A: "Introduction of Silk Cultivation to Khotan in the 1st Century CE," pp. 466–467. ^ "History of Sericulture" (PDF). Government of Andhra Pradesh (India) – Department of Sericulture. Archived from the original (PDF) on 21 July 2011. Retrieved 7 November 2010. ^ a b Ball, Philip (17 February 2009). "Rethinking silk's origins". Nature. 457 (7232): 945. doi:10.1038/457945a. PMID 19238684. ^ Good, I.L. ; Kenoyer, J.M. ; Meadow, R.H. (2009). "New evidence for early silk in the Indus civilization" (PDF). Archaeometry. 50 (3): 457. doi:10.1111/j.1475-4754.2008.00454.x. ^ "Silk city to come up near B'lore". Deccan Herald. Archived from the original on 15 July 2015. Retrieved 22 April 2015. ^ "Tamil Nadu News : Tamil Nadu's first automatic silk reeling unit opened". The Hindu. 24 August 2008. Archived from the original on 19 October 2013. Retrieved 9 November 2013. ^ "Silk: Why It Is Haram for Men". 23 September 2003. Archived from the original on 2 March 2007. Retrieved 6 January 2007. ^ "Office of Tourism – Italy – Calabria, Catanzaro". Archived from the original on 21 August 2015. ^ "La Lonja de la Seda de Valencia – UNESCO World Heritage Centre". Whc.unesco.org. Archived from the original on 14 May 2011. Retrieved 10 April 2011. ^ Diccionari Aguiló: materials lexicogràfics / aplegats per Marià Aguiló i Fuster; revisats i publicats sota la cura de Pompeu Fabra i Manuel de Montoliu, page 134, Institut d'Estudis Catalans, Barcelona 1929. ^ Intxausti, Aurora (May 1, 2013) "La Alpujarra poseía 4.000 telares de seda antes de la expulsión de los moriscos" Archived 26 August 2014 at the Wayback Machine, El País. ^ "Lullingstone Silk Farm". www.lullingstonecastle.co.uk. Archived from the original on 10 January 2015. Retrieved 29 September 2016. ^ Nash, Eric P. (30 July 1995). "STYLE; Dressed to Kill". The New York Times. Archived from the original on 9 November 2012. Retrieved 12 October 2011. ^ Huzjan, Vladimir (July 2008). "Pokušaj otkrivanja nastanka i razvoja kravate kao riječi i odjevnoga predmeta" [The origin and development of the tie (kravata) as a word and as a garment]. Povijesni Prilozi (in Croatian). 34 (34): 103–120. ISSN 0351-9767. Archived from the original on 29 June 2012. Retrieved 17 October 2011. ^ "Silk Production in Konavle". Archived from the original on 9 November 2017. Retrieved 22 April 2015. ^ P.G., Kevan; R.A., Bye (1991). "natural history, sociobiology, and ethnobiology of Eucheira socialis Westwood (Lepidoptera: Pieridae), a unique and little-known butterfly from Mexico". Entomologist. ISSN 0013-8878. ^ de Avila, Alejandro (1997). Klein, Kathryn (ed.). The Unbroken Thread: Conserving the Textile Traditions of Oaxaca (PDF). Los Angeles: The Getty Conservation Institute. pp. 125–126. ^ a b "The Largest Silk Mill in the World; The Story of Skinner Silks and Satins". Silk. Vol. 5 no. 6. New York: Silk Publishing Company. May 1912. pp. 62–64. ^ "Cheney Brothers Historic District". National Historic Landmark summary listing. National Park Service. Retrieved 3 October 2007. ^ Owens, Jody (12 April 2002). "Becoming Sojourner Truth: The Northampton Years". Silk in Northampton. Smith College. Archived from the original on 17 August 2003. ^ For discussion on W. Skinner II's relations with Japanese ministers and merchant-traders, see Lindsay Russell, ed. (1915). America to Japan: A Symposium of Papers by Representative Citizens of the United States on the Relations between Japan and America and on the Common Interests of the Two Countries. New York: G.P. Putnam's Sons; The Knickerbocker Press; The Japan Society. p. 66. "Luncheon to Commissioner Shito". The American Silk Journal. Silk Association of America. XXXIV: 32. May 1915. Reischauer, Haru Matsukata (1986). "Starting the Silk Trade". Samurai and Silk: A Japanese and American Heritage. Cambridge, Mass. : Harvard University Press. pp. 207–209. ^ Thibodeau, Kate Navarra (8 June 2009). "William Skinner & Holyoke's Water Power". Valley Advocate. Northampton, Mass. ^ Mohamad, Maznah (1996). The Malayhandloom weavers:a study of the rise and decline of traditional. ISBN 9789813016996. Retrieved 9 November 2013. ^ Pedigo, Larry P.; Rice, Marlin E. (22 December 2014). Entomology and Pest Management: Sixth Edition. Waveland Press. ISBN 9781478627708. ^ Bezzina, Neville. "Silk Production Process". senature.com. Archived from the original on 29 June 2012. ^ "Mulberry Silk – Textile Fibres – Handloom Textiles | Handwoven Fabrics | Natural Fabrics | Cotton clothes in Chennai". Brasstacksmadras.com. Archived from the original on 9 November 2013. Retrieved 9 November 2013. ^ "Statistics". inserco.org. Archived from the original on 26 January 2016. ^ Astudillo, Miguel F.; Thalwitz, Gunnar; Vollrath, Fritz (October 2014). "Life cycle assessment of Indian silk". Journal of Cleaner Production. 81: 158–167. doi:10.1016/j.jclepro.2014.06.007. ^ Venere, Emil (31 January 2018). "Silk fibers could be high-tech 'natural metamaterials'". Phys.org. Retrieved 2 February 2018. ^ "Piezoelectricity in Natural and Synthetic Silks" (PDF). Archived (PDF) from the original on 20 July 2011. Retrieved 28 April 2010. ^ Ko, Frank K.; Kawabata, Sueo; Inoue, Mari; Niwa, Masako. "Engineering Properties of Spider Silk" (PDF). Archived (PDF) from the original on 31 March 2010. Retrieved 9 July 2010. ^ "To almost match spider silk, scientists regenerate silkworm silk". newatlas.com. Retrieved 18 December 2017. ^ "Silk Powder or Cartridge Bag Cloth". americanhistory.si.edu. Archived from the original on 9 November 2017. Retrieved 30 May 2017. ^ Ricci, G.; Patrizi, A.; Bendandi, B.; Menna, G.; Varotti, E.; Masi, M. (2004). "Clinical effectiveness of a silk fabric in the treatment of atopic dermatitis". The British Journal of Dermatology. 150 (1): 127–31. doi:10.1111/j.1365-2133.2004.05705.x. PMID 14746626. ^ Senti, G.; Steinmann, L. S.; Fischer, B.; Kurmann, R.; Storni, T.; Johansen, P.; Schmid-Grendelmeier, P.; Wuthrich, B.; Kundig, T. M. (2006). "Antimicrobial silk clothing in the treatment of atopic dermatitis proves comparable to topical corticosteroid treatment". Dermatology. 213 (3): 228–33. doi:10.1159/000095041. PMID 17033173. ^ Omenetto, Fiorenzo. "Silk, the ancient material of the future - Talk Video - TED.com". ted.com. Archived from the original on 26 February 2014. ^ a b Rockwood, Danielle N; Preda, Rucsanda C; Yücel, Tuna; Wang, Xiaoqin; Lovett, Michael L; Kaplan, David L (2011). "Materials fabrication from Bombyx mori silk fibroin". Nature Protocols. 6 (10): 1612–1631. doi:10.1038/nprot.2011.379. PMC 3808976. PMID 21959241. ^ Altman, Gregory H; Diaz, Frank; Jakuba, Caroline; Calabro, Tara; Horan, Rebecca L; Chen, Jingsong; Lu, Helen; Richmond, John; Kaplan, David L (1 February 2003). "Silk-based biomaterials". Biomaterials. 24 (3): 401–416. CiteSeerX 10.1.1.625.3644. doi:10.1016/S0142-9612(02)00353-8. ^ Vepari, Charu; Kaplan, David L. (1 August 2007). "Silk as a biomaterial". Progress in Polymer Science. Polymers in Biomedical Applications. 32 (8–9): 991–1007. doi:10.1016/j.progpolymsci.2007.05.013. PMC 2699289. PMID 19543442. ^ Zhou, Cong-Zhao; Confalonieri, Fabrice; Medina, Nadine; Zivanovic, Yvan; Esnault, Catherine; Yang, Tie; Jacquet, Michel; Janin, Joel; Duguet, Michel (15 June 2000). "Fine organization of Bombyx mori fibroin heavy chain gene". Nucleic Acids Research. 28 (12): 2413–2419. doi:10.1093/nar/28.12.2413. PMC 102737. PMID 10871375. ^ Kardestuncer, T; McCarthy, M B; Karageorgiou, V; Kaplan, D; Gronowicz, G (2006). "RGD-tethered Silk Substrate Stimulates the Differentiation of Human Tendon Cells". Clinical Orthopaedics and Related Research. 448: 234–239. doi:10.1097/01.blo.0000205879.50834.fe. PMID 16826121. ^ Kundu, Banani; Rajkhowa, Rangam; Kundu, Subhas C.; Wang, Xungai (1 April 2013). "Silk fibroin biomaterials for tissue regenerations". Advanced Drug Delivery Reviews. Bionics – Biologically inspired smart materials. 65 (4): 457–470. doi:10.1016/j.addr.2012.09.043. PMID 23137786. ^ Zhang, Yaopeng; Yang, Hongxia; Shao, Huili; Hu, Xuechao (5 May 2010). "Antheraea pernyiSilk Fiber: A Potential Resource for Artificially Biospinning Spider Dragline Silk". Journal of Biomedicine and Biotechnology. 2010: 683962. doi:10.1155/2010/683962. PMC 2864894. PMID 20454537. ^ Wray, Lindsay S.; Hu, Xiao; Gallego, Jabier; Georgakoudi, Irene; Omenetto, Fiorenzo G.; Schmidt, Daniel; Kaplan, David L. (1 October 2011). "Effect of processing on silk-based biomaterials: Reproducibility and biocompatibility". Journal of Biomedical Materials Research Part B: Applied Biomaterials. 99B (1): 89–101. doi:10.1002/jbm.b.31875. PMC 3418605. PMID 21695778. ^ a b Meinel, Lorenz; Hofmann, Sandra; Karageorgiou, Vassilis; Kirker-Head, Carl; McCool, John; Gronowicz, Gloria; Zichner, Ludwig; Langer, Robert; Vunjak-Novakovic, Gordana (1 January 2005). "The inflammatory responses to silk films in vitro and in vivo". Biomaterials. 26 (2): 147–155. doi:10.1016/j.biomaterials.2004.02.047. PMID 15207461. ^ Fan, Hongbin; Liu, Haifeng; Toh, Siew L.; Goh, James C.H. (2009). "Anterior cruciate ligament regeneration using mesenchymal stem cells and silk scaffold in large animal model". Biomaterials. 30 (28): 4967–4977. doi:10.1016/j.biomaterials.2009.05.048. PMID 19539988. ^ Minoura, N.; Aiba, S.; Higuchi, M.; Gotoh, Y.; Tsukada, M.; Imai, Y. (17 March 1995). "Attachment and growth of fibroblast cells on silk fibroin". Biochemical and Biophysical Research Communications. 208 (2): 511–516. doi:10.1006/bbrc.1995.1368. PMID 7695601. ^ Gellynck, Kris; Verdonk, Peter C. M.; Van Nimmen, Els; Almqvist, Karl F.; Gheysens, Tom; Schoukens, Gustaaf; Van Langenhove, Lieva; Kiekens, Paul; Mertens, Johan (1 November 2008). "Silkworm and spider silk scaffolds for chondrocyte support". Journal of Materials Science. Materials in Medicine. 19 (11): 3399–3409. doi:10.1007/s10856-008-3474-6. PMID 18545943. ^ Lundmark, Katarzyna; Westermark, Gunilla T.; Olsén, Arne; Westermark, Per (26 April 2005). "Protein fibrils in nature can enhance amyloid protein A amyloidosis in mice: Cross-seeding as a disease mechanism". Proceedings of the National Academy of Sciences of the United States of America. 102 (17): 6098–6102. Bibcode:2005PNAS..102.6098L. doi:10.1073/pnas.0501814102. PMC 1087940. PMID 15829582. ^ Wang, Yongzhong; Rudym, Darya D.; Walsh, Ashley; Abrahamsen, Lauren; Kim, Hyeon-Joo; Kim, Hyun S.; Kirker-Head, Carl; Kaplan, David L. (2008). "In vivo degradation of three-dimensional silk fibroin scaffolds". Biomaterials. 29 (24–25): 3415–3428. doi:10.1016/j.biomaterials.2008.05.002. PMC 3206261. PMID 18502501. ^ Kojima, K.; Kuwana, Y.; Sezutsu, H.; Kobayashi, I.; Uchino, K.; Tamura, T.; Tamada, Y. (2007). "A new method for the modification of fibroin heavy chain protein in the transgenic silkworm". Bioscience, Biotechnology, and Biochemistry. 71 (12): 2943–2951. doi:10.1271/bbb.70353. PMID 18071257. ^ Tomita, Masahiro (April 2011). 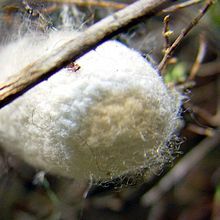 "Transgenic silkworms that weave recombinant proteins into silk cocoons". Biotechnology Letters. 33 (4): 645–654. doi:10.1007/s10529-010-0498-z. ISSN 1573-6776. PMID 21184136. ^ Stancati, Margherita (4 January 2011). "Taking the Violence Out of Silk". Wall Street Journal. Archived from the original on 22 January 2015. Retrieved 22 January 2015. Callandine, Anthony (1993). "Lombe's Mill: An Exercise in reconstruction". Industrial Archaeology Review. XVI (1). ISSN 0309-0728. Good, Irene (December 1995). "On the question of silk in pre-Han Eurasia". Antiquity. Vol. 69, Number 266. pp. 959–968. Kuhn, Dieter (1995). "Silk Weaving in Ancient China: From Geometric Figures to Patterns of Pictorial Likeness." Chinese Science. 12. pp. 77–114. Sung, Ying-Hsing. 1637. Chinese Technology in the Seventeenth Century – T'ien-kung K'ai-wu. Translated and annotated by E-tu Zen Sun and Shiou-chuan Sun. Pennsylvania State University Press, 1966. Reprint: Dover, 1997. "Chapter 2. Clothing materials". Ricci, G.; et al. (2004). "Clinical Effectiveness of a Silk Fabric in the Treatment of Atopic Dermatitis". British Journal of Dermatology. Issue 150. pp. 127–131. Look up silk in Wiktionary, the free dictionary. Wikimedia Commons has media related to Silk. This page was last edited on 9 April 2019, at 04:21 (UTC).